Today we will look at Equifax Credit Report given by Equifax – a worldwide credit bureau. It has started giving credit reports and credit scores in India just like CIBIL (read about CIBIL Credit report). CIBIL was the first credit bureau in India that initiated giving credit scores for individuals. Banks and other lending institutions have started looking at these individual credit reports before approving any sort of loans and hence these credit reports have become the backbone in deciding whether or not you will be given any loan now or in future. Equifax credit report is a consolidated report given by Equifax Credit Information Services Ltd. This report contains details of your past and current credit behaviour. It also has the details about all the outstanding loans and enquires done in the past. Equifax is the second credit bureau in India to provide such credit reports after CIBIL. Just like CIBIL, Equifax Credit Bureau also provides CIR (credit report) and Credit Score + CIR. If you just want a credit report (without score) it would cost Rs 138, however if you need Credit Score (comes with CIR), it would cost Rs 400. Equifax Credit Report is said to be more useful as it is represented with graphs, pictorial description and better colour coding as compared to CIBIL reports and hence should be more user-friendly for the individual as well as loan/credit approving authority to understand the minutes. As much as 150+ institutions share the data with Equifax regarding their customers credit behaviour (CIBIL has 500) and it has past 48 months of credit history. What does Equifax Credit Report Contain ? 2. Credit Summary: Get a quick overview of consumer’s key credit characteristics. 3. Recent Activity: Helps you quickly access consumer’s recent activity including accounts which have gone delinquent, new accounts that have been opened, etc. 4. Account Details Section: Account-wise details of the consumer’s repayment history. 5. Inquiries Section: Details the Inquiries made on a consumer. What is Equifax Credit Score ? 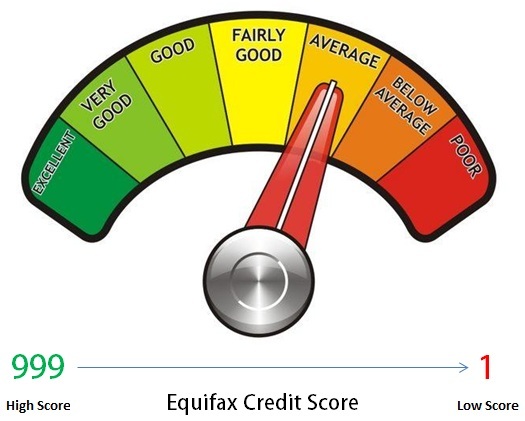 Equifax Credit Score is a numerical score ranging from 1 to 999 that is assigned to each person. This credit score will determine how good or bad your score is. Higher the credit score, better your repaying capability is. “The risk score is designed to predict the likelihood of a customer defaulting over the next 12-month period. An account is said to be a default when it crosses the 90 days mark of no payments. The score will help banks monitor their loan portfolios,” says Samir Bhatia, managing director and chief executive officer, Equifax. What makes Equifax Credit Score ? Who can get credit score ? Equifax Credit score is available to anyone – whether he has any credit history or not. Unlike CIBIL who scores only for those individuals who have some kind of credit history in the past, Equifax scores individuals with no past credit history as the individual being assessed will have some kind of score based on parameters like address, city and income level. How much does Equifax Credit Report cost ? It would cost Rs. 138 to get a credit report and Rs 400 to get your Credit Score (along with Credit report). However those who want to monitor it throughout the year can choose an option to get their Equifax credit report 4 times a year for Rs 1,000. Those who are looking for any kind of loan can choose this option as they can monitor their report every quarter. How to apply for Equifax Credit Report ? 6 : Post receipt and validation of documents, the credit report shall be sent via courier or postal service within 7 working days on a best effort basis. Incase you find some mistakes in your credit report or any kind of mistakes , you can raise a Dispute resolution with Equifax by filling this Dispute Resolution Form . All you need to do is fill up the form , attach the required documents mentioned in their website and send it to them. Equifax will followup with the banks and try to resolve the dispute. Now there are two credit bureaus in India, CIBIL and Equifax – So the obvious question is, “Which one is better?” and Does it make sense to have credit score from both the companies? You will be surprised to know that in India many banks are already looking at more than one credit report and are expected to look at multiple sources of information before lending to anyone. So having a credit report and credit score from two credit bureaus will help a lot. So if you have good credit score with both CIBIL and Equifax, it really works in your favour as it’s a double confirmation for the banks that you are a good customer. Whereas if you have a bad score – “god save you”… It would be extremely tough to get a loan in that case. Also incase there is any discrepancies in the scores then banks can give more weightage to one score and less to other or just choose one score which it feels right. So incase you want to check your Equifax credit report go ahead and apply for it. My Experian Score = 563?? How the hell did Experian come up with that number especially when Cibil and Equifax have me higher on the credit rating? My Equifaxscore is 741. Please tell me whether it is good or not.As i had done many late payments in credit.Iam Having only one Credit card. So how much Chances is that I can Get loan. It all depends on the bank and how they look at that score. HI Manish My CIBIL score is 816 and my Equifax Credit Score is 621.How can I have very good credit score with one bureau and very bad score with other.What does this mean.Am I at risk getting my loan/credit card application getting rejected.I have a total of four credit cards one is a secured credit card against ICICI bank and other three are unsecured credit cards.I have taken a loan for my laptop way back in 2005 and cleared,a two wheeler loan in 2012 and cleared it and and consumer durable loan and am clearing the consumer durable on time.I have never made a late payment once.I have made all my credit card payments in time.There is not even a single instance in which I have made a late payment.Why is my credit score very low in Equifax and good in CIBIL? Yes it can happen .. a credit beaureu can have its own algo to find the score and parameters with different rankings. I think you should check with the Equifax on this and ask them if you have any specific remark on your report? DrYVNR, can you please give an update if you were able to contact Equifax since I had a similar issue. My CIBIL is 789 but my Equifax score is 502. Equifax is making peoples for earn Money only. Do not worry about both of them just pay your credit on time. Bank and all lender are not to provide loan actually they are business hubs and wants earn money in form of Interest . and these all score are only for negotiation for interest rate. I have also received on report from Equifax through CreditMantri website and have CIBIL report also from Bank both are different and in Equifax Report there are two loan shows that not related to me in any matter although earlier i was not aware that lender company exist. while i talk to that company the company manager also reply me there is no record about you in our company. when i talk to CreditMantri site then they asking me a fee for resolving the issue. there is no matter to resolve only they creat them self first and ask money for resolving . its just cheating innocent peoples in fear of rejection of those peoples Loan. My Equifax Credit score is 531, Is this is a good score ? and am i eligible for applying personal loan after 3 months. I think equifax score is between 0-999 . From that point of view, 531 is not a great score. Anyways please check your remarks in the report. I just checked my score at Equifax and absolutely shocked to witness that my score is 680 despite the fact that I am an avid user of credit cards from last 79 months and do not have a single instance when I delayed my cc payments or settled any amount. I have not availed any loans so far, neither I made any application for any loan. Now I have a serious concern on the credibility and scoring process of Equifax. However now I am applying for CIBIL score as well so cross check the authenticity of this score. What according to your opinion might be the reason for such low score. Also I want to know how I can improve this score. Dont worry this much. 680 is an average score considering its 0-1000 . The main thing is not the score, but the remarks on your report (I am putting up next article on this topic) . Score calcualtion is a secret thing and you never know what factors are considered (but you know high level things) . Credit card usage is not a big thing, Its a unsecured credit so never defaulting on that does not mean you will have high score. If it were a secured loan like home loan or a car loan, your score would have been better. Thanks for your quick response. My report is absolutely clean and do not have a single remark. However I use 6-7 cc for various reasons and benefits. So is this the reason my score is not that good? Can I surrender 2-3 cc which I use least? Another question is how CIBIL score is compared to Equifax? Will it be again almost same? – Increase your credit limit by asking the card company, Make sure you are only using 40% or less of your credit limit. CIBIL is widely used by lenders to check the reports. Equifax might also be used by some lenders. SO if you apply for loan, its the bank decision from where they want to verify your data. MOstly CIBIL is used. I think you should look at CIBIL as the benchmark. If you have 750+ score on CIBIL with no bad remarks, you are safe ! Hi, I see Creditmantri provides free equifax report. Is it legit? Who bears the cost here? I am not sure on that. Is should be legit, because is a tie up ! With more credit rating agencies companies ..it’s surprising to note that.. They are all serving needs of the banks to mitigate risks ..without putting reponisbility of accuracy of data.. Bank Loan data accuracy no space science ..it about accounting for loan repayment transactions ..its duty of the banks do it for the interest income they earn ..the business customer has given them to earn income ..I wonder .why these rating agencies have been so restrictive and expensive in giving credit report and credit score to loan consumers..how about making it say Rs 100 per report + score ..millions will have it any time they need..I wish to see the day in immediate future ..when consumers carry Credit Score like they carry their PAN Cards and UIDs and any other personal IDs .it empowers them to question decisions by the banks ..Jago Borrower days ar here ..wait and watch ..See creditkarma.com and mint.com in US how they have changed consumer loans and banking space .. Thanks for sharing your views on this ! My equifax credit score is 887 is it supposed to be good?? Given that the maximum score is 999 , 887 is a very good score ! I understand the ratings are based on the loan taken, spending activities of a consumer. The data is going to be pretty much the same since its per consumer basis. In that case, why are there more than 1 agency (CIBIL is foremost) for such ratings? They all differ in their algorthims and the detailing level and the way of representation. So banks might want to check with 2-3 agencies. Its like we have so many banks ! whats to get surprised in that .. they are new right now and slowly setting up processed , it will happen slowly ! Like Equifax, Experian is also new in India but they have provided option of NEFT payment in their bank account. However, till date Equifax is yet to start these user friendly payment options. Hope soon they enable NEFT payment option as going to bank and getting a DD is cumbersome. . .
Yup .. i am aware about it ! .. MOstly they should start the NEFT facility pretty fast ! Useful information to all, thanks. i request you to provide one information, one of my friend bought personal loan and not paid properly due to some personal reason. His name came under defaulters list. after few month he settled full amount. Later he tried to get two wheeler loan, but they refused to give the loan as expected by me. How to come out of the defaulters list? this information will help many. I got the report from Equifax and there is no loan or Credit in my name.As earlier intimated I have not taken any loan in my life and I donot know why CIBIL has not send my report so far and whether is problem. Please advice whether Banks/lending institutions are taking Equifax credit report or they are believeing on CIBIL report . CIBIL is totally fraud and still I donot know from whether they have collected my name and the report which i recieved from HDFC shows 7-8 credit cards,4 housing loans,3 car loans,4 personal loans . These type of loans even I have not heard earlier.Can I suite a case against CIBIL? Thanks for your blog on Equifax. Logically u should file case…..as they are giving incorrect information about you and making bad name for you…….. but i guess u need to go through T&C. One more thing….I am not sure about this…but u can get the information about source of information about such scrap info from CIBIL once you raise dispute ….and you can actually take case of those institution rather than CIBIL….as CIBIL as usual will reply that “CIBIL rely on information from Institution….so they will stick to that…..”. Good to hear that .. are you in some bank ? There will issue with credit score reported by institutions like equifax unless it is associated with one of the bank loans / credit cards. Since in india we don’t have anything unique id assigned to each person ( UID is still under implementation) it is hard to find a person as well as it is easy to do some manipulations. On the positive side, this is going to very useful. On an avg around the world each country has 3-4 credit score companies maintaining credit scores. I will not be surprised if we see experian also come with credit score. Any monitoring going forward I think should be provided on all credit scores rather than one. It is hard to manage go behind each and every credit score company for monitoring. to analyze & update the data periodically. I think it’s good for the customers like us who wants the quick response from the Banker or lender. So that they can look for other sources. This is a good information, but then as mentioned in comments by amit there are many loop holes to these credit reports and it makes miserable for common man to prove his innocence on many false information, so decision of banks to lend or not only on these reports should be rechecked . I applied on 28th Dec and still waiting for my CIBIL report.Their customer care responce is also very poor. You & Your team Member(s) are doing a Great Job of “Jagofying ” the investors at large and my heartiest compliments for the same. With the advent of EQUIFAX services available now and many likely to come in in the future, it will augur well for both the Investors and Institutions which is mutually beneficial. The report to the Investors /Individuals should focus more on the Graphics/Pictures & make it user friendly and easily comprehensible . Currently the online submission of the forms including an attachment for the docs/Payment is not available on Equifax and if they can implement it will add more convenience to more People. This holds good for CIBIL which has online payment but no online submission. Moreover these people should provide soft copies -have they done that? I am not sure . Guys go head and continue to do a great Job!! What if both have conflicting summary…..
As far as i know about CIBIL. I found some information errors in CIBIL procedure…..
CIBIL take information about person form Institution. Now Institution forward same form to CIBIL to update and enquire of Credit info. CIBIL update data whatever comes to them and give thm our credit rating. But for Person whose data they are updating is not correct. When we generate dispute, they will not rectify those data unless institution update thm correct data. This is what happened with me…I told them information is wrong. they replied we wont change unless institution update correct address. But I m sure Institution dont have any address proof of address they gave as my resident address. that adress is my office address. i found it has loopholes..
you can find these marketing ppl standing near billing counter of malls to just give u free credit card….they will say they will fill up form and they will also send person to your home to collect documents…. Yes you are correct , there are loopholes .. but as of now CIBIL takes data only form institutions .. we can also check from our side after taking a credit card that our detials are correct or not . Did you talk to customer care of credit card ? Whats the problem you are facing to change the address ? I have chked with them … but i guess i was denied that time for credit card….so they(institution ) was not ready to take that pain….now twist is – the same institution offlately gave me card with limit higher than earlier offered. They have kept my communication address as my resident address. which is correct. now when i got my CINBIL report last week. My address mentioned is same as earlier(earlier i got my report befor i join new firm). Here since i got the card from that institution as part of salary account opened with them after joining new employer. My all details they have should be correct bcoz all form are filled by HR and Accounts dept. CIBIL has detail of my new Credit card…..but still they are using same old address of my old office….now question is when institution would have filled my new details with CIBIL, did they filled with my old employer address? So i feel we are handicap to do rectify any thing with CIBIL from our end….if luck favour us and Institution correct our info with them, then ok…..else we cant do any thing….. Note that all the institutions from which you have the loans/cc will update the CIBIL about it , so if you have credit card from BANK A and BANK B , both A and B will update the CIBIL . so seems like you still hold a card with someone who had that old address ? NO ? No i dont hold as i was denied fst…. that time during enquiry they updated my wrong address. after 5 months when i changed my company same institution gave card just because now i was holding thr salry account of same bank…..and form which would have sent to thm for opening my salry account, wont be having my old office address which is obvious…. there were 4 address in report…. now from this i understood that whenver this marketing ppl ask for Business card we should never give them… coz to cutshort time they will update that address as resident address. That was my mistake which i have realise…..but many of us will be doing that…and may be this will be example for thm to beaware of those marketing personnals…..But CIBIL should have chked adress proof for address updated by Insitutions….when request for CIR report…they ask address proof and all….Ultimately…information provided by CIBIL can hurt me when i will be going and opting for Big loans…. that disput i have raised for second time asking thm to get address proof from institution…and i am awaiting reply form CIBIL…. my point was here to share the loophole which i found in CIBIL process…. Thanks Harsha 🙂 .. did you check your reports from CIBIL or Equifax ?